Tickets can be purchased at Little Caesars Arena XFINITY box office and Ticketmaster.com. To charge tickets by phone, call 800-745-3000. 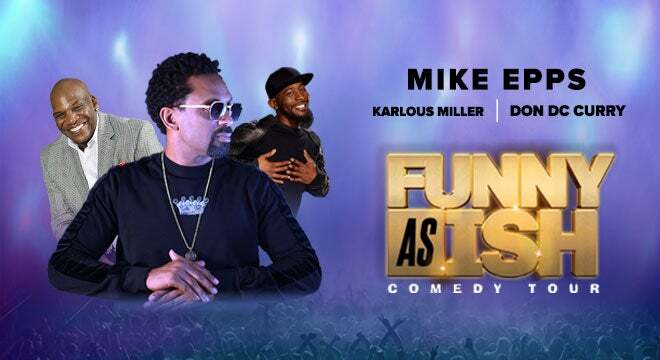 Comedian and actor Mike Epps brings the “Funny as ish Comedy Tour” to the Fox Theatre on Friday, February 15, 2019 at 7 p.m. and 10:30 p.m. Accompanying Epps are Karlous Miller and Don "D.C." Curry. Epps will be joined on stage by some of the biggest names in comedy. Karlous Miller is a veteran cast member on MTV's Wild ’N Out. The NBC’s Last Comic Standing Alum, can also be seen on MTV’s Joking Off, BET’s Comic View and more. Guy Torry has been seen on BET’s Comic View, Comedy Central’s Premium Blend, and more. Guy also hosted the enormously successful 52-city comedy tour “The Kings of Comedy,” which grossed over $37M. Film credits include Runaway Jury, Don’t Say A Word, Pearl Harbor, Life, The Animal and most notably American History X.
Mike Epps has generated an extraordinary amount of buzz among his peers within the entertainment industry for being one of the funniest comic actors to emerge in the Hollywood scene. Since 2000, Epps steadily climbed his way up the stand-up comedy ranks when he was recognized by a national audience in 1995 for appearing on HBO’s Def Comedy Jam (which, years later, he would go on to host). During a performance at LA’s Comedy Store, Epps caught the attention of Ice Cube. This led to the first of three feature films they would do together: the cult hits Next Friday, Friday after Next, and All About the Benjamins. Other features include the Hangover franchise, Girls Trip, Faster, Hancock, Lottery Ticket, Next Day Air, Roll Bounce, The Fighting Temptations, the Resident Evil franchise, Bait, How High, Dr. Dolittle 2, Talk to Me and Guess Who? Karlous Miller is a comedian/actor most known for being a veteran cast member on MTV's Wild ’N Out with Nick Cannon. NBC’s Last Comic Standing alum, Karlous can also seen on MTV’s Joking Off, MTV2’s Uncommon Sense, BET’s Comic View and Bill Bellamy’s Who’s Got Jokes. Every week, Karlous hosts the hit 85 South Show podcast with DC Young Fly, which has gained a fanbase across the globe. He most recently filmed for HBO’s stand-up series All Def Comedy (reboot of Russell Simmons’ Def Comedy Jam) as well as his 30-minute special on Kevin Hart’s Laugh Out Loud network. Karlous has also guest starred in the sitcom Family Time for BounceTV.